ambr® crossflow provides at early development stages access to molecule behavior related to viscosity, buffer composition, shear stress and performance in membrane processes. It enables a lot of important additional decision criteria for the final candidate selection and speeds up this process significantly. A small scale, high throughput automated system enables greater number of molecule | buffer combinations and process control conditions to be investigated. As a result early stage R&D productivity and efficiency will be improved significantly while costs per experiment are reduced. ambr® crossflow is a benchtop crossflow system optimised for ultrafiltration and diafiltration applications. It is a small scale screening system with a minimum recirculation volume of 5 mL and a dedicated new range of ambr® CF filter cassettes with 10 cm² membrane area. Parallel operation is achieved with 4 independent crossflow channels per module, with up to 4 modules managed by one control station. This means ambr® crossflow is capable of performing membrane screenings with up to 16 ambr® CF filters simultaneously. Intuitive hardware and software design ensures that the system is quick to set up and easy to use, while full system automation ensures reliable process control and reduced manual intervention. Expand your ambr® crossflow system and tailor it to your actual demand with 4, 8, 12 or 16 channels. Each ambr® crossflow module consists of four independent crossflow channels, and up to 4 modules can be managed by one control station. This enables you to perform membrane screening with up to 16 ambr® CF filters and 32 diafiltration buffers. Recipe design is intuitive with drag-and-drop preprogrammed phases and is also flexible allowing users to design their own phases and recipes from scratch. Basic operation procedures are predefined e.g. Each ambr® crossflow module consists of four independent crossflow channels. Up to 4 modules can be managed by one control station. ambr® crossflow is capable of performing membrane screening with up to 16 ambr® CF filters simultaneously. ambr® CF filter is a 10 cm² single-use crossflow cassette. Once opened from the packet, the user simply lifts the filter holder handle, slides the filter into the housing and closes the handle – plug-and-play crossflow unit operation. Each crossflow channel represents a fully equipped crossflow system. It comprises of a 100 mL graduated retentate vessel situated on a load cell for level control with an integrated impeller for effective mixing. Automated pinch valves are located on the retentate and permeate streams and there are two peristaltic pumps; one to control crossflow rate and the second to load the system with experiment fluids. Within the filter holder there are three pressure sensors, on the feed, permeate and retentate. A pH probe is located in the retentate vessel and a conductivity sensor is located in the filter housing. ambr® crossflow can be operated with single-use bags or with glass bottles. System control is fully automated therefore requires minimal manual intervention when in operation. The 21” touch screen control system displays all process information allowing for user-friendly operation, even when editing the process on the fly. Recipe design is intuitive with drag-and-drop preprogrammed phases and is also flexible, allowing users to design their own phases and recipes from scratch. Each channel operates independently with individual control of process conditions, set points and control strategy. ambr® crossflow software can additionally be installed on user PCs to enable writing of process sequences at your desk, before transferring to the control system. Data is automatically collected and stored within the experiment folder. Experiment data can be viewed on the control system, or on a user PC with the ambr® crossflow software installed. Alternatively, data can be exported as .csv files. Linear scale up from 50 cm² to as much as 0.14 m² on SARTOFLOW® Smart and from 0.1m² to 2.1 m² on SARTOFLOW® Advanced at lowest recirculation volumes. 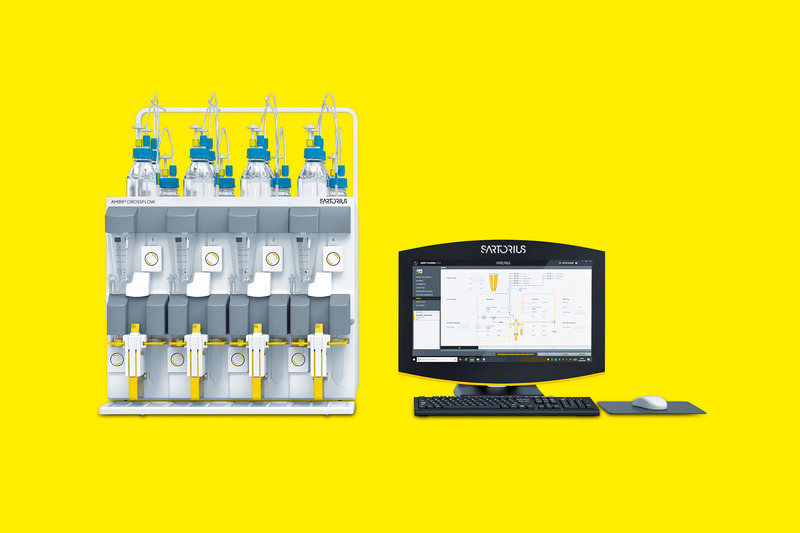 Two systems that offer a combination of full flexibility and outstanding crossflow filtration performance.